One of the nice things about Floridays RV Park is our makeup—and I don’t mean lipstick and eye shadow! While all 84 sites are generally occupied during the South Florida season from November to May, our community makeup of full-timers, snowbirds, and drop-ins helps preserve that down-home Old Florida feeling. It also creates delightful opportunities for guests to mix and mingle. Events Coordinator Diane calls out the Bingo numbers every other Tuesday night, and guests work up a sweat competing in Floridays-sanctioned ping-pong tournaments. 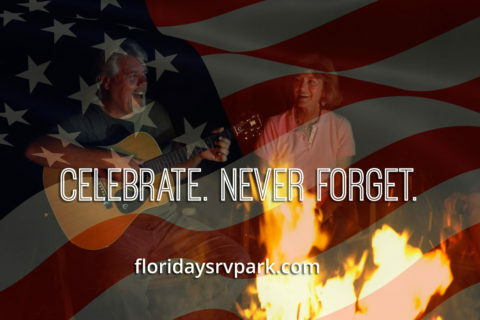 There are potlucks, pizza, and Italian nights where everyone brings a side dish, and almost every community dinner is followed with a campfire, guitars, or open-mic night led by Floridays’ own Mr. “T” (just “T”), weather permitting of course—which is often because of our almost perfect location along the coast where the Gulf Stream keeps temperatures moderate a few miles inland year round. If the guests at Floridays actually needed a reason to party, there’s general consensus that NASCAR Season from late October through November is the #1 reason, quickly followed by the buildup to Super Bowl Sunday in February. The rest of the year takes a bit more imagination, but Diane and her supporters always pull off something fun and relaxing.